Posted August 22, 2015 by Heather Michet & filed under Food, Food As Medicine. There very well could be. Some weird “honey” is on the market: it’s being served in restaurants and sold in groceries at a ridiculously low price. The reason why it’s so cheap? It’s mixed with corn syrup as the main ingredient! Rather than support the heavily subsidized (and most likely GMO) corn syrup product, buy pure honey from where it naturally comes from: bees and your local beekeeper. You will be healthier and so will your local food system, not to mention the bees. Corn syrup can produce many negative impacts on your body, most notably blood sugar spikes. It also carries chemical fertilizer residues that can interfere with hormonal balance, lead to cancer and offer a host of other nasty “side effects” from eating it. Seeing this product is also a good reminder to read all food labels before putting them in your grocery cart. An item may look like “the real thing” but on closer inspection, it is nothing close to the real deal. If there’s ever doubt about a product’s integrity or healthfulness, go back to the land: the earth and the farmer produce the real thing. 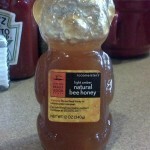 Note: The honey bear pictured contains the real thing: 100% natural honey. Not only does the label state this, but the honey’s slightly crystallized nature confirmed it.